Best place to eat sushi in Sydney? Picking your food off a belt, savouring a tasty but quick meal and off your on way in less than half an hour - this is what a sushi train experience should be. 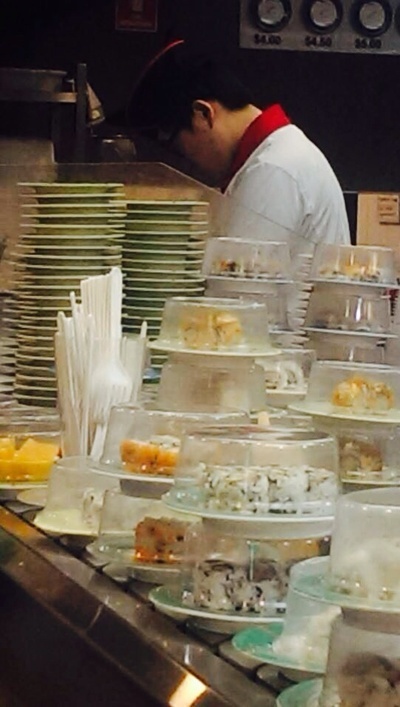 What is the best Sushi train type of restaurant you have been to in Sydney? Otherwise, if sushi trains are not your thing, where do you like to eat some sushi in Sydney? For sushi trains I love Makoto at Liverpool Street in the City, and also at Chatswood. With a proper sit down sushi experience, although small I love the sushi at Sushi on Stanley. The latter is a cash only establishment, and they're so generous with the raw fish. Yum! This might come as a surprise to some people but the Koreans actually invented sushi and the Japanese adopted the cuisine when they raided the country stealing their pottery experts and other bits of Korean culture. At least that is the story that Koreans tell. But you might be converted when you try the Korean version, which they call Gimbap. However, at Sushi Bay, on Riley Street in Penrith, which is run by Koreans, it is still known as sushi but it really is the best sushi that I have tried anywhere in Sydney, partly because it is something a bit different and is endlessly inventive. They don't do the live squid sushi, a traditional dish I once experienced on a trip to South Korea, but that might not be to every Sydneysider's tastes. My favourite sushi train is Sushigoi in Coogee. It has heaps of variety, including creative dishes that you don't usually see at sushi trains. Also, the staff there are the most friendly I've seen, always greeting you with an happy "irasshaimase!" (please come in!). Sushi Train at Newtown is also really nice. Sushi Bay in Stockland Merrylands has the best train I've ever eaten from, the service there is top quality and the store itself has a very homely, yet exotic feel about it. I love it! I've tried out a few in the past few weeks, and my favourite is definitely Sushi Hotaru on level 1 in the Galleries on George St. The food is at a really decent price and great quality. Plus if you can't find what you want on the belt they have their menus on ipads at the tables and booths to order from. Really great place for a quick and inexpensive meal out! Best place to buy cake ingredients in Sydney? Best place to go skiing near Sydney? Best golf resort in Sydney? Best martial arts school in Sydney? Best place to buy macarons in Sydney? Have you been to any Christmas in July events? Do you wear fancy hair accessories?